1. Geometrical errors of the model. Kinematic model is not reality; it is a mere simplification. When controlling a real robot, the control uses a model that performs close to reality. It would not be possible to add every needed parameter to the model in order to perfectly picture reality. Besides, parameters in the model can only be measured to a given tolerance. 2. Mechanical errors: manufacturing tolerances, assembly errors, misalignments, damages, wears, thermal influences are difficult to control. 3. Measure devices errors. Deviations coming from measure devices also introduce errors to the measured TCP. To reduce the effect of the geometrical errors, calibration and parameter optimization techniques are followed. However, for trying to reduce mechanical errors different approaches need to be taken. Here it is described a new industrial software developed by PKMTricept SL, where automatic measuring of TCP deviations for Tricept robots is addressed. First of all, it is needed to define what zone of the work space it is needed to be optimized and for what tool orientation (five different tool orientations (Z+, Y+, Y-, X+ and X-) can be selected). The envelope limits and the grid density are first defined (Fig. 1). Then, the information of all the points to be measured is displayed. At this point it is possible to select which points are not needed and how we want to organize their order in the path that the robot will follow (Fig. 2). 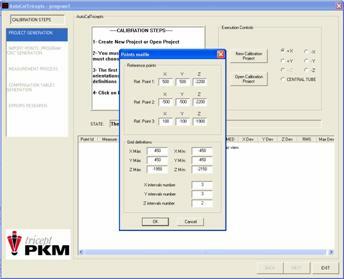 After that, the CNC code, based on the selected grid and points, can be generated for the Tricept. The program can be loaded into the machine and the robot will start moving to the commanded points. This software can work together with any laser tracker to measure the TCP position automatically. Once all the points have been measured, a "best-fit" algorithm is used for all the orientations. A program containing all the deviations is automatically generated. It can then be loaded into the control. After it Siemens 840D control takes care of the calculation of the correction of the TCP at any orientation of the tool. 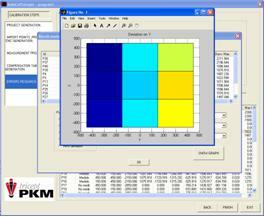 The software also permits to analyze the calculated deviations graphically (Fig. 3).